Whenever I get the chance to point something out that might help prevent a major repair, I try to provide that information to my local customers and my readers—wherever you are! We have been replacing turbochargers pretty frequently lately, and for a while I thought it was just isolated to the 2005 models. That no longer seems to be the case. So, I have provided a few suggestions on how you can help prolong the life of your turbo and your Subaru engine. The following information pertains to the 2005 and newer Subaru Legacy GT, Outback, and Forester XT. While other models have some issues of their own—and some of the basics such as changing the oil still apply—this article focuses on these specific models. If you own a 2005 and newer turbocharged Subaru, you may have experienced some problems where the turbo becomes starved for oil and eventually fails. In the most extreme cases, the whole engine could fail. 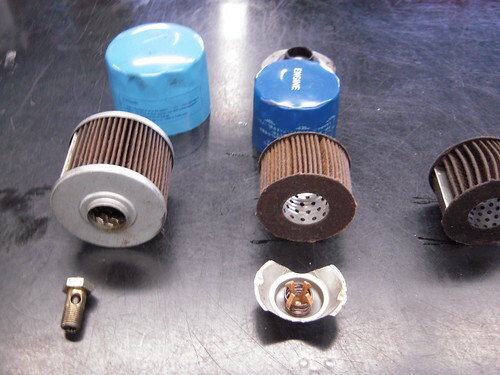 The picture below is the current oil filter being used by Subaru. Notice how small it is. Regardless of the theory that using synthetic oil can extend the oil change interval, you must understand that on this model Subaru engine, no matter what kind of oil you use, the filter itself can only filter so much before it becomes restricted with matter and goes into bypass mode. 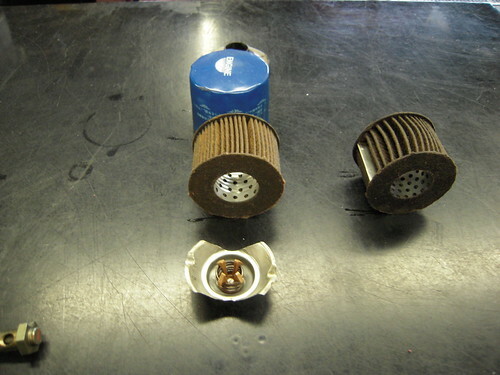 For reference, the air filter on the left is the one used on all pre-2006 Subaru Non-Turbo engines. Notice it is considerably larger than the one on the right. As the oil filter becomes clogged and goes into bypass mode, there is a good chance that the filter in the bolt will become restricted. 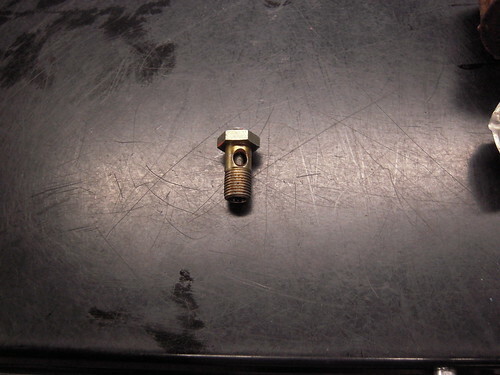 This is a picture of what Subaru calls a union screw, but it's basically a filter installed in the oil supply line to the turbo. If this filter is restricted, oil has trouble getting to the turbo. The turbo will not get the oil it needs and will ultimately overheat. We suggest checking—and if needed, replacing—the oil supply bolts every 60,000 miles or so, depending on how the vehicle is being used. That will run you about $15.40 (for the bolts) plus labor to install. Replacing the turbocharger at $1600 to $1700, not to mention dealing with damage to the engine, is considerably more expensive. Subaru's oil change recommendation for turbocharged models is every 3,750 miles. If you want your engine to last, you should maintain the vehicle based on how you use it and not simply the recommendations from the manufacturer. In five years, if you save a couple hundred dollars in maintenance costs only to shell out thousands of dollars in repairs, what have you really saved? If you are lucky enough to own a turbocharged Subaru, make sure you take care of it. Thanks for the great write up and pictures. I am currently dealing with this problem on a car I love to drive. This information is going to be crucial to keep my Subaru on the road for the long term. I have a 2005 Forrester turbo with a little over 62,000 miles. I bought it used but the original owners supposedly took decent care of it. A while back I seemed to have less pick-up. I had a mechanic check it and the turbo bearings had worn out. I was out of town and couldn't change the turbo until I got home. Just before home it started smoking like crazy. I had it towed and it needed a new turbo, 1600 bucks, ouch! After I got it back it was still smoking. Apparently something got sucked into the turbo fins and basically destroyed my new turbo. After 2 weeks of nothing Subaru parts department refused to replace the turbo and a used one was put in just to get my car back. It still seems to not have the pick-up it should. I am so fed up with this car I don't know what to do now! Great article, I had a 2009 subaru forester xt, two weeks before while driving it starts making some loose chain noise. When I am driving at 70- 80 km/hr the cruise speed makes no sound and turbo seems to be completely dead. Then I checked with Apex specialized auto repair service and they found the turbo is completely gone and it causes to burn oil. They corrected the issue before it begins to do more damage to rest of the engine. Hello all! I recently had a major problem with my 05 Subaru Legacy GT. Initially the turbo blew and I had a new one put in as well as all new oil lines going in and out of it. After paying close to $2400 (yikes) the new turbo did the exact same thing!! The compression blades were shredded and the new high pressure oil line going from the turbo to the oil pan was blown open. Both the mechanic and myself were amazed that this same problem happened twice. We came to the conclusion that there was something in the engine which was breaking down and sending metal deposits through the oil lines which was clogging the screen and eventually starving the turbo for oil. Thankfully he refunded the money and now I have a 148k m car in my front yard that needs something, I'm just not sure what. Any and all opinions would help me at this moment. Thanks for reading.